Dave Golden attended Pekin High School from 1961-65 where he lettered in three seasons under legendary coach Dawdy Hawkins. Dave led Pekin High School to 58 wins in 63 games as a junior and senior including the 1964 Illinois State High School championship game. 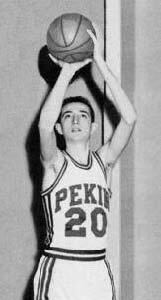 As the starting junior guard on the Pekin State championship team of 1964, he led Pekin in scoring 18 points in the championship game against the Apple knockers from Cobden Illinois. Dave was named to All-State Tournament Team in 1964. Dave received All-State honors in 1964 and again in 1965. He is the number 5 all time scorer in Pekin High School basketball history with 1334 points and ranks as number 35 in the Greater Peoria Area. Dave was selected to the Parade Magazine’s 1965 high school boy’s all-American third team. Of the more than 66 colleges to recruit Dave he decided to play at Duke University for Coach Vic Bubas. Dave lettered at Duke in 1967, 68, 69 where he played in 80 games and scored 752 points. During the 1967, 68 seasons he played in the NIT and in 1968 Duke had risen to AP ranking of number 10 in the country. Always a leader, Dave was team captain during his senior year. Today Dave makes his home in Parlin, NJ. Mike Dunne, a former Limestone High School and Bradley University standout athlete, authored a two-way road into the Greater Peoria Sports Hall of Fame. 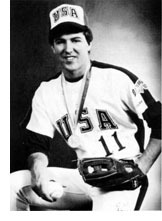 First, he is a former Olympian, pitching for the United States in the 1984 Olympic games in Los Angeles. Second, he is the seventh former major league baseball and the third pitcher, to be inducted. A fine pitcher for Dewey Kalmer's Bradley Braves during his first two seasons, Dunne became a hot big league prospect in 1984 when he went 8-2 for Bradley, gave just 62 hits in 85 innings, fanned 77 hitters and had a 2.44 earned run average. In his three-year BU career he was 13-8 and whiffed 117 hitters in 167 innings. ì"He always pitched against the better teams," said Kalmer. "I've only had three pitchers who walked in and pitched the big games for me. Mike was one of those. He became a great pitcher when he learned to throw the slider." Joining the U.S. Olympic team in the summer following his junior year, he pitched against Italy in a winning game but the U.S. eventually lost the gold medal game to Japan. Signing with the St. Louis Cardinals, he was traded to Pittsburgh along with outfielder Andy Van Slyke and catcher Mike LaValliere for catcher Tony Pena on April 1, 1987 before he could pitch in a big league game for the Redbirds. He had a fine rookie season with the Pirates, going 13-6 with a 3.03 ERA and giving just 143 hits in 164 innings. Injuries then hampered much of the rest of his career and he was dealt to Seattle and later pitched for both San Diego and the White Sox. His last big league game was in 1992 for the White Sox. His big league career covered five years and he finished with a 25-30 record and a 4.08 ERA. He pitched in 85 games, 76 of them as a starter, gave 471 hits in 474 innings, fanned 205 and walked 225.